The Weight Of Dehydration - Why Is Water Not Enough? The Weight of Dehydration – Why Is Water Not Enough? The human body is made up of approximately 70% water, so it is obvious that we need to drink a lot of the stuff! Water flushes out impurities, makes organs function properly, lubricates and cushions joints, assists in regulating body temperature, and helps cells regenerate. Water is an extremely important factor in weight management too; dehydration can reduce metabolism by 3%. The liver requires water to not only process nutrients and send them to the right place in the body, but to also metabolise stored fat. By the time we feel thirsty, we are already dehydrated. When this occurs the kidneys turn to the liver for support, and again the liver’s ability to metabolise stored fat for energy is reduced – which results in unwanted weight gain. Drinking plenty of water also helps prevent us from mistaking thirst for hunger, and minimises the chances of us overeating. Ironically too, whenever the body seems to be holding too much water in the wrong places – in the form of fluid retention ‘water weight’ and puffiness, drinking more water is the best thing to help combat this issue. Water is essential for good digestion, brain function, and us being healthy. Water also makes our skin good, and results in us generally looking younger – so let’s drink up! One of the main places water is stored in our bodies is lean muscle, but this storage is impeded if there is an excess of body fat. So one of the most common health issues seen in people with a high excess body fat and low muscle mass, is the difficulty to maintain hydration. 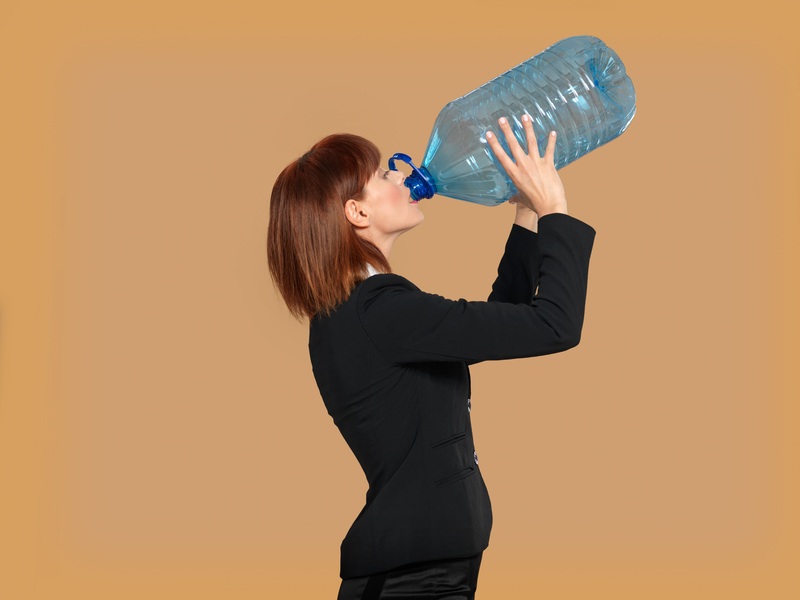 As a result, despite drinking what would be considered a sufficient amount of water, people with a high body fat percent are often dehydrated, and end up dealing with a lot of inconvenient and uncomfortable health problems. • Feeling lightheaded and dizzy. • Memory problems, confusion, ‘brain fog’, and even hallucinations. • Mood changes, especially irritability. • Digestive problems, particularly constipation. • Urinary problems, such as decreased urine output and/or cystitis. • Poor exercise endurance and/or tolerance. • Muscle weakness and/or cramping. • Itchy and dry eyes. • Skin problems; especially cracked lips, and eczema. • DO NOT wait until you are thirsty to drink. • Ensure you drink the right amount of water your body needs – as a general guideline 500mls per 10kg of body weight. • Take notice of increased sweating due to hot weather/environments, and increase your water intake as required. • Monitor your physical activity level – an additional 1 litre of water may be required if performing intense activity for an hour. • Travelling by air can result in an extra 500mls of fluid loss per hour of flying, so always increase your water intake. • Sip water gradually; do not gulp (or water will flush through your system too quickly, and dilute/remove valuable nutrients). • Aim for approximately 1 glass of 200mls per hour. • Drink a glass of water upon waking daily – this is when we are most dehydrated and need to flush toxins from the body. • Always have water with you – in your bag, in the car, at the office. • Exclude caffeine drinks from your daily quota – their diuretic effect results in more fluid being lost than is being replaced. • If you are struggling with drinking plain water, try adding some fresh lemon, lime, mint, or ginger. • Drink a glass of water 30 minutes before meals – to assist the digestive process and reduce the likelihood of overeating. • Balance your sodium and water intake – do not over-salt meals, and only use Himalayan salt or Celtic sea salt. • Try to only drink filtered water.